Natural head lice remedies are a safe alternative for natural lice treatment that rid head lice fast and offer effective herbal lice prevention, without harmful ingredients, pesticides or toxic chemicals. Safely rid head lice with a head lice remedy because it's natural, chemical-free and without risks of harmful side-effects! Just talking about lice is enough to make you feel itchy all over, but recurring head lice infestation is extremely common. It can happen to anyone. However, head lice typically affects children between 3-12 years of age. Head lice is very contagious. Head-to-head contact or sharing personal belongings increases the risk for infestation. 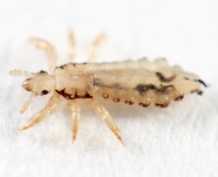 If not treated immediately, head lice can cause skin irritation and infection. A wide variety of over-the-counter or prescription head lice treatment products are available. However, these contain harmful pesticides and toxic chemicals. If you or your child suffers from asthma or allergies, or if you are pregnant or nursing, consult your doctor before using these lice treatment products or consider a safer head lice remedy alternative for natural lice treatment. Lice can be extremely difficult to eradicate, and some are missed during shampooing and household cleaning. Repeated exposure to the dangerous chemicals in an over-the-counter head lice treatment can be more harmful than lice themselves. Lice prevention is the key to avoiding serious harm. Natural head lice remedies contain NO toxic chemicals. A safer option is the use of herbal lice prevention products. Natural head lice remedies are a safe, chemical-free and non-toxic solution to rid head lice fast! Wash bed linen, towels and clothing in hot water with detergent. Place in dryer on high for 30+ minutes.